1. 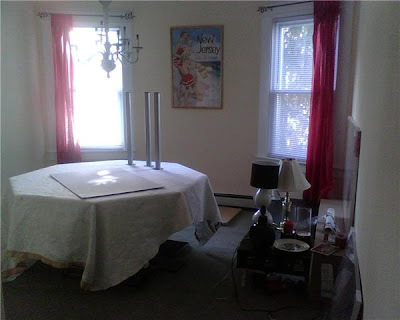 Operation Make Dining Room Presentable - Yes, that's my dining room. No, that's not my table cloth, its just a drop cloth. Since I could make 5 goals for that room alone I'm gonna have to sublist this sucker. a. Finish painting light fixture - It was originally burnished brass with beige lampshades. Talk about depression inducer! I ditched the shades and am halfway through painting it...literally. Note to self: Buy more paint. b. Paint side table legs - The side table is the perfect finish and size but has gray legs. Self, buy white spray paint while at the Depot. c. Remove anything that could be defined as a Pile of Crap - Those lamps and knick knacks need to stop loitering and find a real place - or its to The Closet for them! e. Fill second lamp holder - I have a pair but only one pillar candle. I have some river rocks that may look nice. Tinker. Its a miracle I sleep at all with such dilemmas in my life! 3. Feign Buffness - I finally gave up and got a punching bag. I hate push ups and don't carry my niece enough to have buff arms. I've been punching around for 5-10 minutes every morning but so far only have soreness to show. I've looked into kick boxing classes but my area is rather yuppy'ish and most of the adult classes are for yoga. Yoga is nice but I want faster results not a calmer mind! 4 Validate new computer - I got a computer two months ago and it still hasn't been properly set up. I know, I know. I've been using the laptop for a few years and have gotten so used to its portability that I don't even long for my 23" monitor. I have a few gigs lined up though and need the visual real estate. So I need to order it a network card install programs. 5. Work - See how I mentioned new gigs up there? For one I have almost all the information I need and for the second I need to schedule an appointment to go in and work. My dvd cover friend mentioned a second cover too so that would be fun to work on. I need to allot time for work instead of getting sucked into home decor or a new book (I've been going through fiction like we're about to hit 451 degrees this summer).